Paul Coleman was out with the Weekend Wanderers Detecting Club. The buried treasure of coins one man found with his metal detector. EVER SINCE YOU were a child have you always dreamed about finding some buried treasure? Paul Coleman was out with the Weekend Wanderers Detecting Club with his metal detector, when he discovered over 5,200 silver coins. The amateur archaeologist’s find was unveiled at London’s British Museum today. The discovery is one of the largest ever finds of Anglo-Saxon coins from the 10th and 11th centuries was made by Paul Coleman while out on an organised dig in central England. The treasure, dating from the reigns of King Ethelred II (978-1016) and Canute (1016-1035), was buried in the village of Lenborough, Buckinghamshire. The coins are unofficially estimated to be worth over €1.34 million. Coleman said that he nearly did not make the 100 mile trip from his Southampton home to the dig site to avert the cost of filling up his car with fuel. It was almost written on the cards. It was a long way to go, we don’t normally travel that distance. I had that feeling that the day would end well — it’s pure fate! The coins were today unveiled at London’s British Museum. The coins were found in good condition as they were covered in mud and were wrapped in a lead sheet. It’s a very rare treasure, and (it’s) rare to find so many coins all together and in such good condition. Coleman will share the bounty with the landowner. He said he hoped to buy a bigger house for entertaining his grandchildren. It reported discoveries had increased significantly in recent years, with 990 in 2012, 993 in 2013 and 1,008 in 2014. There were only 201 finds in 1998. The number of discoverers waiving their right to a reward also doubled in five years, allowing museums to acquire them cheaply, according to the report. 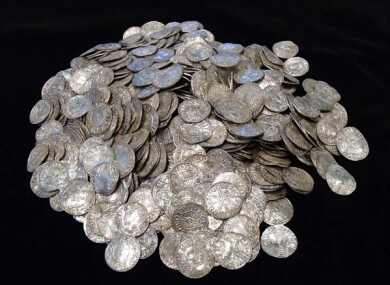 Email “Man with metal detector finds one of Britain's largest hoard of buried treasure... hopes to buy new house”. Feedback on “Man with metal detector finds one of Britain's largest hoard of buried treasure... hopes to buy new house”.